Baked Vegetable Spring Rolls with Rice Paper are healthy version of our regular spring rolls. Crunchy spring rolls with a delicious Chinese filling. Spring rolls are one of our most favorite snacks. Be it Vegetable spring roll or paneer spring roll or chicken spring roll, each of these are loved by food lovers. Spring rolls are a perfect snack for a tea time party. They also can be prepared as starters/appetizers. Chinese vegetable spring rolls are one of our favorite snacks. This is one such snack which we mostly order when we go out to eat at a restaurant. Firstly, as the name suggests, we will make these spring rolls using rice paper. What is rice paper? Rice paper is basically made up of rice flour, salt and water. (Broadly speaking). You can make recipes like fruit rolls, spring rolls, chicken rolls etc. using rice paper. How to use rice paper? You just need to dip each rice paper in water for 5-10 seconds. This step would make the rice paper a bit softer. Now you can use this rice paper as a spring roll wrapper. Place the rice paper on a flat surface. Add one-two teaspoon of filling. Apply cornstarch paste (I have described about it below) on the ends. Fold. That’s it. Where can I find these rice paper? You can buy these from your local market shops or you can buy these on Amazon. Now let us talk about the filling. The filling’s ingredients are quite simple. We will use some veggies like carrots, capsicum, mushrooms etc. To make these vegetable spring rolls a bit healthier, I have added nutrella (Soya) granules to the filling. If you want, you can avoid it. We will cook the filling by adding some sauces, salt, pepper etc. Allow the filling to cool down a little bit and then you can start making your vegetable spring rolls. I have baked these vegetable spring rolls. You can also fry these spring roll. Heat enough oil in a deep wok or a kadhai. Deep fry these veg spring roll on a medium flame. I prefer baking them as these are healthier than the deep fried ones. But it’s up to you as both the versions taste delicious. 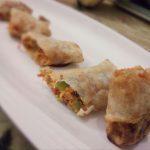 You can serve these baked vegetable spring rolls with sweet chili sauce or you can also prepare a quick dip. Heat a teaspoon of oil in a small pan. Add around a teaspoon of chopped garlic. Saute for a minute. Add two teaspoons finely chopped mint. Saute on a low flame for 2 minutes. Now add two teaspoons sweet chili sauce, one teaspoon tomato sauce, salt and pepper . Mix well and cook for two minutes. Switch off the flame and add one teaspoon grated cheese. Give it a quick stir. A quick yummy dip for your baked veg spring roll is ready. You can serve these baked vegetable spring rolls as an evening appetizer. You can prepare these for a small get together at your home. Thus this is an easy spring roll recipe. I hope you would give this recipe a try. Baked Spring Rolls are healthy version of our regular spring rolls. These are perfect tea time snack as well as party snack. Soak nutrella granules in water for about 10 minutes. Take a pan. Add oil and heat it. Add garlic. Saute for a few seconds. Now add capsicum, carrots, cabbage and mushrooms. Saute them for around five minutes. Add nutrella. Remember to squeeze out water, before adding nutrella granules. Add salt, pepper, soya sauce and green chilli sauce. Saute for a minute more. Now we have to prepare a sealing paste. Mix 1 tablespoon of maida/cornflour and 1/2 tablespoon of water to make a thick paste. Now let's make our spring rolls. Preheat your oven to 200 degree centigrade. Take a spring roll sheet. Put a small amount of filling on it. Roll it from one side. Now apply the sealing paste on the other two ends of the spring roll sheets and seal them. Put a small amount of sealing paste on the other end. And finally seal your spring roll. Make the rest of the spring rolls similarly. Take a baking tray. Put a butter paper on it. Gently place your spring rolls on it. Brush them with a little oil. This will ensure that they get baked properly and will also give them a nice color. Bake them in the oven for about 10 minutes at 200 degree centigrade.